CONCORD, N.H. - With the arrival of spring, many species of wildlife are giving birth to their young. Finding young wildlife can be exciting, but in most cases, even if it appears abandoned, its mother is not far off. If you encounter young wildlife - even young animals that appear to need help - the kindest and safest thing to do is to leave them alone and let nature take its course. Reports have already begun coming in to Fish and Game and local wildlife rehabilitators from people who have picked up young animals, often mistakenly thinking they are orphans. "Picking up fawns, baby raccoons or young animals is an error in judgment," says N.H. Fish and Game Wildlife Programs Supervisor Kent Gustafson. "People think they're doing a good deed, but they are often removing the animal from the care of its parents and potentially exposing themselves to the risk of disease. In particular, your actions may result in the animal having to be euthanized for rabies testing." Young wild animals (including mammals, birds, reptiles and amphibians) typically have their best chance of surviving when they are in their own natural environment, says Gustafson. What should you do if you find a young animal? "Give wildlife plenty of space and leave them alone and in the wild, where they belong," he said. If in doubt, report the location of the animal to N.H. Fish and Game by emailing wildlife@wildlife.nh.gov or calling 603-271-2461. Gustafson explains that seeing a deer fawn alone, for example, does NOT mean that it is orphaned or that it needs your help; it is normal for a doe to leave her fawn alone while she goes off to feed , and in many cases, the doe will not return until nightfall. 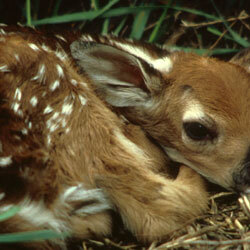 Leaving the fawn undisturbed, and where it is, gives it the best chance of being reunited with its mother. "Fawns are not defenseless creatures. Their cryptic coloration, tendency to stay perfectly still and lack of scent are all adaptations that help them survive," Gustafson said. Does are easy for predators to detect because of their size and scent, so they keep a distance from their fawns, except during brief nursing sessions, so that predators don't key in on them. If sympathetic people handle or repeatedly visit a fawn, it only serves to draw the attention of predators and discourage its mother from returning. "This hands-off and keep-your-distance policy also applies to bear cubs and moose calves," Gustafson continued. "It's also worth noting that sows and cows can and do actively protect their young. In any case, if you're lucky enough to see a deer fawn, bear cub, moose calf or other wild animal, count your blessings and leave the area." Only qualified people with special rehabilitator permits, issued through N.H. Fish and Game, may take in and care for injured or orphaned wildlife. Improper care of injured or orphaned wildlife often leads to their sickness or death. For example, under NO circumstances should anyone feed a fawn. Improper foods such as cow's milk invariably lead to severe diarrhea (scours), which is usually fatal. Unless you have rehabilitator credentials, it is illegal to have in your possession or take New Hampshire wildlife from the wild and keep it in captivity. For a list of licensed wildlife rehabilitators, go to wildnh.com/Wildlife/wildlife_rehabbers.htm. The New Hampshire Fish and Game Department is the guardian of the state's fish, wildlife and marine resources and their habitats. Visit wildnh.com.